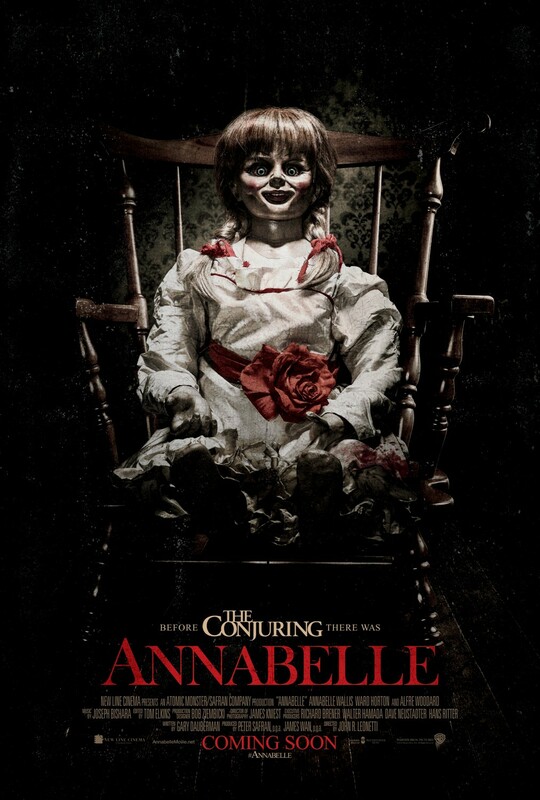 Chrichton's World: Review Annabelle (2014): Much better than I expected it to be! Review Annabelle (2014): Much better than I expected it to be! At first I was expecting a lot from Annabelle. There is something about creepy looking dolls. Somehow they can unnerve you. And in The Conjuring it did made me wonder why someone would ever get it in their head to buy such a doll. Annabelle explains us why. Was the explanation satisfactorily? In hindsight I think yes. Could they have gone deeper into it? Of course they could and should have. Is it as good as The Conjuring was? No. But still it was far better than I expected this to be. The doll looks scary as hell and even just looking at it for a few seconds is unsettling. Let alone if the doll comes into action. Now the film does show us a little too much far too quickly. Although because of the audience knowing and the main characters left in the dark about what is going on also adds some serious tension. I do say that some scares are cleverly set up where you think you can predict what is going to happen and then something different occurs. Not too many of those but still enough to keep you on edge for a bit. The pacing is a little off as it moves through certain events quite fast but then lingers on moments where you are wondering why they are doing that since usually nothing noteworthy happens. Annabelle offers a decent watch and certainly not a waste of your time. Just don't expect this to be on par with The Conjuring or Insidious.